The Bridges 2e Center for Research and Professional Development will host the Study with the Masters Institute on July 21-26, 2019, at Bridges Academy in Studio City, CA. Spend six days learning from experts in the 2e field through keynote addresses, nine courses, and workshops across three focus areas: Leadership for 2e-friendly schools; meaningful curriculum and instruction; and understanding the complex 2e mind. The primary goals of the Center are to create awareness, offer professional development, provide outreach, and generate projects that will improve services for the special population of children known as twice exceptional (2e). The 2e Center operates within a positive psychology framework, emphasizing that more is to be gained from understanding and acknowledging what a child can do than from focusing on deficits and problems –– an approach all-to-common in many schools. Workshops on curriculum development and innovative, strength-based instruction. Training on instruments, assessment tools, and growth indicators. Mentoring faculty members in professional activities such as professional writing and workshop presentations. The 2e Center encourages research studies, both internal and external, that serve to build a base of best practices for twice-exceptional education; to assess awareness levels and needs; and to better understand the 2e learner. In addition, the staff and Executive Board of the Center develop and field-test protocols and instruments specifically designed to measure strengths, interests, and talents. Directors, faculty and members of the 2e Center and Bridges Academy are available for professional development and awareness workshop. Please contact Kim Vargas for more information or fill out the contact form below. 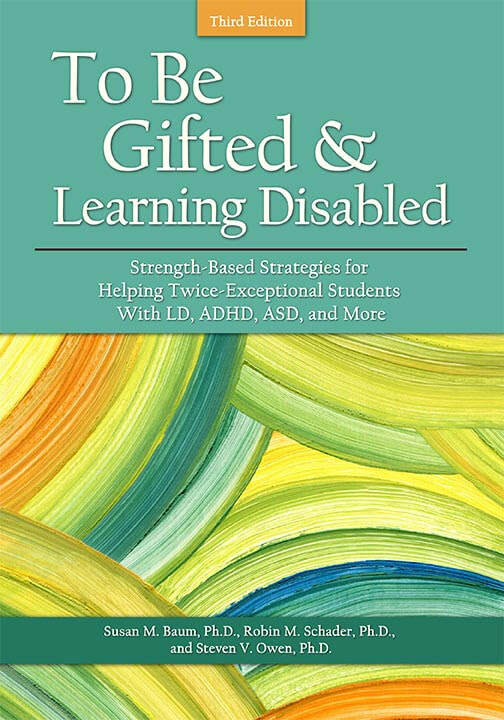 To Be Gifted & Learning Disabled: Strength-Based Strategies for Helping Twice-Exceptional Students with LD, ADHD, ASD, and More, written by 2e Center Director Susan Baum, Bridges trustee Robin Schader, and Steve Owen, won the Book of the Year Award in the practitioner category. Discover tools designed to help educators connect with the person in personalized learning. The 2e Center for Research and Professional Development's next symposium will be held on October 11-13, 2019, in Los Angeles. More information on program offerings will be available in October, and event registration is scheduled to open in November. Check back here for updates as the registration period approaches. ​In the meantime, questions regarding next year's symposium can be submitted via the form on this page. We look forward to sharing the exciting details about this exceptional event!